I grabbed this mid-way through my reading for my Cinderella-theme week because the contrast amused me. Not Nina Alexander that’s for sure. With her best gracious loser face firmly in place, Hollywood’s hottest starlet is hoping to end her evening of disappointment with a graceful exit stage left. Only an unexpected proposal and an awkward wardrobe malfunction mean that this is certainly going to be a night to remember… for all the wrong reasons! So what girl would resist the gorgeous Dominic Kelly coming to her rescue?! Especially when he’s whisking her out of the paparazzi’s prying eyes on the back of his motorbike – and wearing a tux to rival James Bond! Not a Fairy Tale surprised me! It's not often a romance novel can manage that! Now, it's certainly a contemporary romance as we might as expect - a couple who are attracted to each other, have reasons not to seek a long-term relationship together even while one or both yearn for it, and things happen to force the issue. The basics of the romance itself were all quite familiar, though handled very enjoyable here (except for one glaring thing that I'll get to in a moment). What was surprising and new about this book, for me, was the actress training for a tough role component. I've read stories in which one or the other character was toughening up for one reason or another (the most recent example involved a female former soldier training to become a firefighter), but I've never read this exact twist on it before. It was clear that the author knew her stuff - the details not only about training, but about what's involved in stunt work, contract negotiations in the film industry and filming itself were all great! Most importantly, I loved Nina and Dom. I loved the respect that was so obvious between them, I loved how fearless and yet vulnerable Nina is, and that Dom doesn't go easy on her. I loved the back and forth that they had going, particularly when it came to trying to explore their attraction. Lots of heat here once they both finally do indulge! Really good stuff! The only thing I disliked about this book was a plot development near the end that had me throwing my e-reader at the pillow on my bed (because I'm not crazy - I didn't want to break it!). I was so frustrated by it that I nearly stopped reading. I'm glad that I didn't because despite wanting a different way to bring all the relationship tension to a head, I thought that Not a Fairy Tale handled this twist as well as it could. So kudos for that, but I'm still taking half a star for this unwanted development, which I think is tough but fair. There's a cast of secondary characters that I absolutely loved. Some are clearly from the earlier books in the series - and I'm tempted to go back and read them, so you know I loved this one. * Nina's entourage were all so... I don't know. Appropriate for their jobs, even when it made them unlikeable? 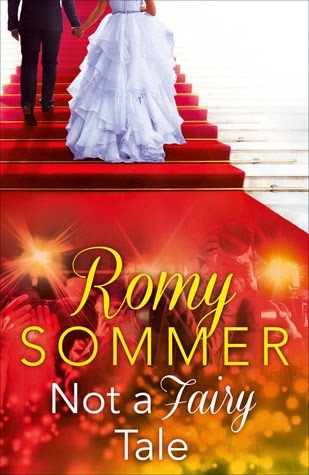 It actually made me want to read a romance featuring someone in one of their positions... maybe the PA (not Wendy specifically, but someone in that role), who falls for... a friend of the actress for whom she works. I also really liked Dom's friends - stunt people are so cool - and even his rather bitchy and/or irritating sisters. Not a Fairy Tale was, really, a modern fairy tale at its finest: two people bonding over a shared determination to work hard for what they want out of life, coming together despite the odds. I really enjoyed this book - it really was quite different from what I usually read in the contemporary romance genre! *I almost never go back and re-read. I have to read series in order. Even if they can be read out of order, I hate doing that! Thank you so much for the review, Chelsea. I really appreciate the time and effort it takes to write a review. Out of interest, my third book 'To Catch a Star' features a PA to a Hollywood actor, though she's not the average PA.